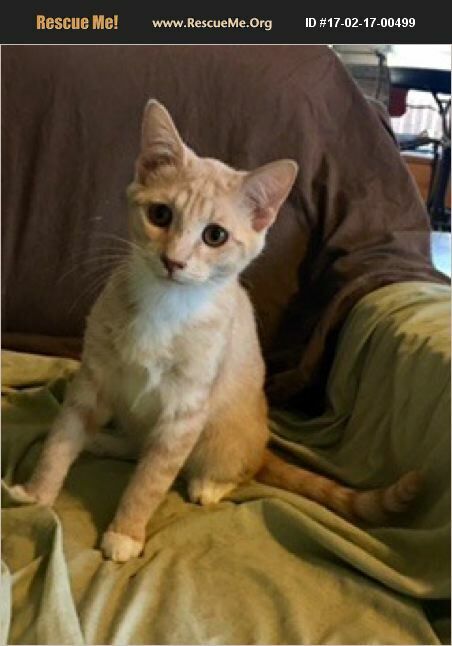 My name is Mac, and I am an adorable, outgoing, and fun-loving buff-tabby-with-white DSH fella who was born in October 2016. I'm mostly a beautiful cameo color with white mittens and a white bib. I hope that my angelic face and big eyes have already captured your attention! Surely you already know that we ginger tabbies are famous for our outstanding personalities. I am very playful as well independent and get along great with all the other kitties and even the two little doggies in my foster family! I was turned in to a shelter as a stray orphan kitten, but luckily my future foster meowmy rescued me. Now I am ready for a lifetime home to call my own. I hope that you'll come meet me so that I can melt your heart the minute you see my angel face! Mac is updated on shots, neutered, dewormed, microchipped, FIV/ FeLV negative, and ready for his indoor-only home. No de-clawing permitted. His adoption fee is $125 for kittens 9 months old and younger, cash or check payable to Buster's Friends. Please click the contact button if you are interested in Mac, and we can let you know exactly where you can meet him. To make the process more efficient, download the adoption application at http://www.bustersfriends.org/catadoptionapplication.shtml. First save and then open it; then you can print it and fill it out.